We were contacted by a client in St John’s, Worcester with a request to work on their Georgian Town House. The house had been updated with modern fixtures and fittings and the owners were looking to restore it back to all its original period features and specifications. However, in addition to authentic features, the owners wanted modernity. They were keen to live in a home that provided the modern comforts we all expect and so the brief included a request for a draught-proof energy efficient solution within the remit. 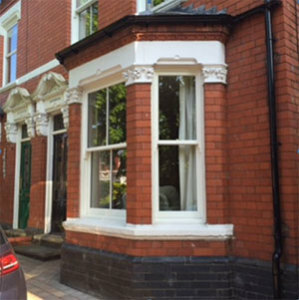 We started by removing the contemporary plastic windows from the property which were certainly not in keeping with the feel of a Georgian Town House. 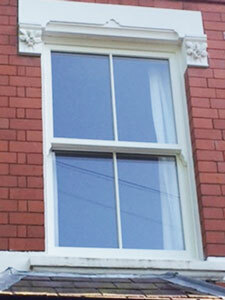 We replaced them with bespoke sliding sash windows that were far more traditional for this kind of dwelling. Using the best quality products and our professional team for installation, these new windows were highly energy efficient and able to meet the client’s expectations. Although windows are a huge contributing factor to the overall look of a home, the front and rear doors are also a part of the house that draws the eye. If not in keeping with the rest of the dwelling, they can make the home look unsightly. For this Worcestershire town house the rear door was in need of a complete replacement. Consequently, we have been working on a solid oak door that would be more in keeping with the traditional rear entranceway for a property of this period. Ensuring natural light is able to light the hallway, this solid oak door will feature a small glass pane. This will also help achieve a cottage feel. The client has been really happy with our work, believing we have achieved the remit of providing modern comforts with a period update. If you have a project that we can deliver for you then give our friendly team a call on 01905 841 199 or email info@ruraltimberwindow.co.uk and arrange a consultation.